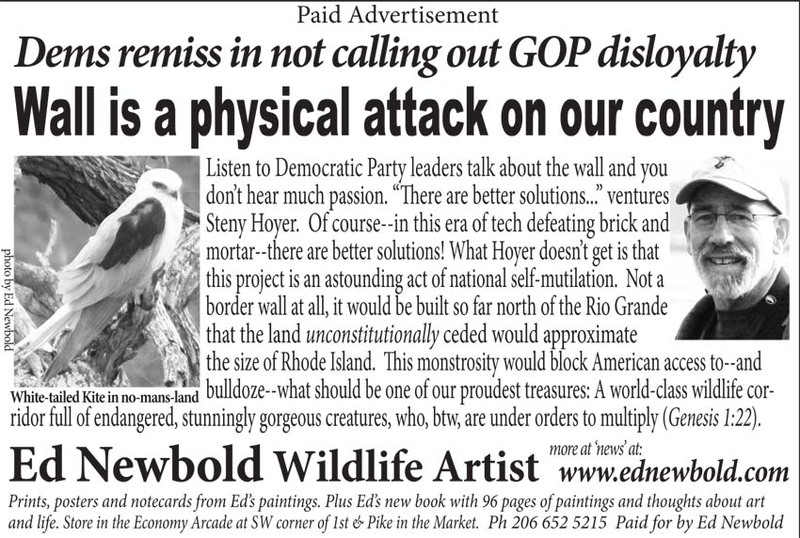 I am running the above ad in the Seattle Times A-section for Sunday, October 7, 2018. 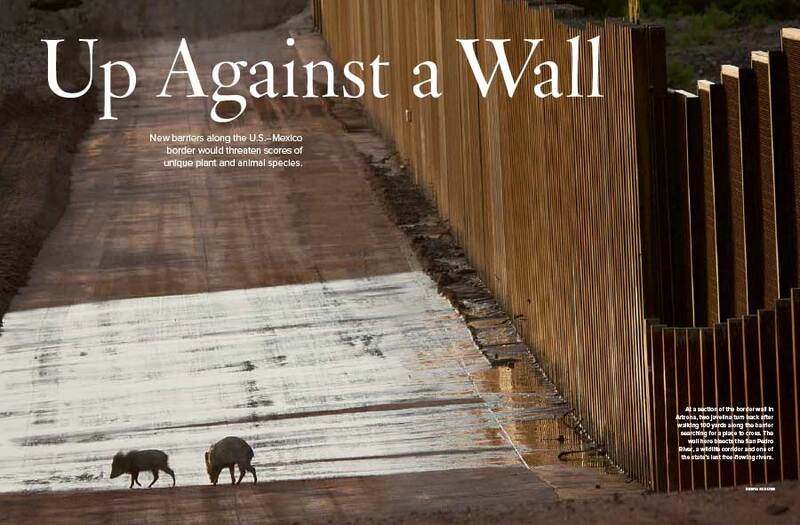 An article in the National Wildlife Federation’s magazine confronts the damage that is and will be done by a wall. Listen to Democratic Party leaders talk about the wall and you don’t hear much passion. “There are better solutions…” ventures Steny Hoyer. Of course–in this era of tech defeating brick and mortar–there are better solutions! What Hoyer doesn’t get is that this project is an astounding act of national self-mutilation. Not a border wall at all, it would be built so far north of the Rio Grande that the land unconstitutionally ceded would approximate the size of Rhode Island. 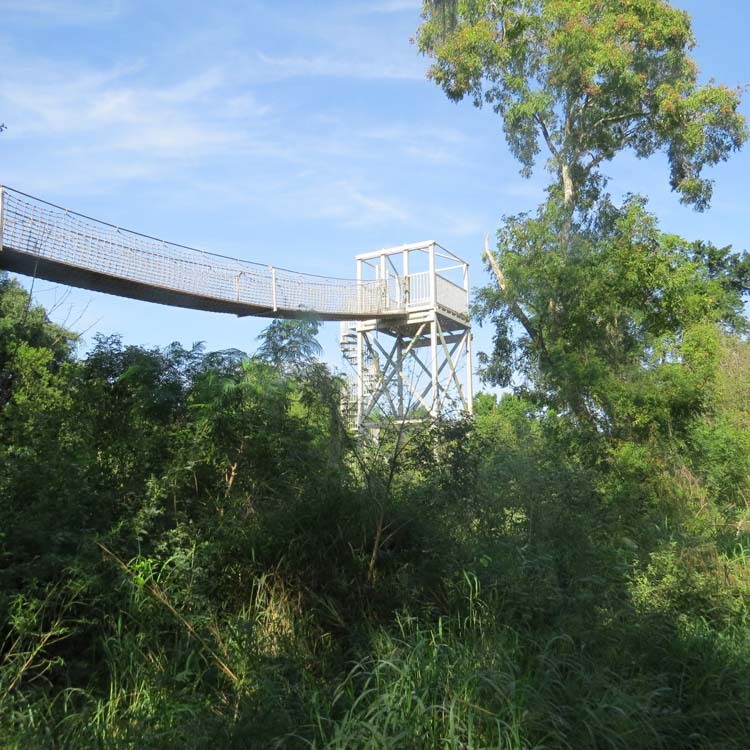 This monstrosity would block American access to–and bulldoze–what should be one of our proudest treasures: A world-class wildlife corridor full of endangered, stunningly gorgeous creatures, who, btw, are under orders to multiply (Genesis 1:22). 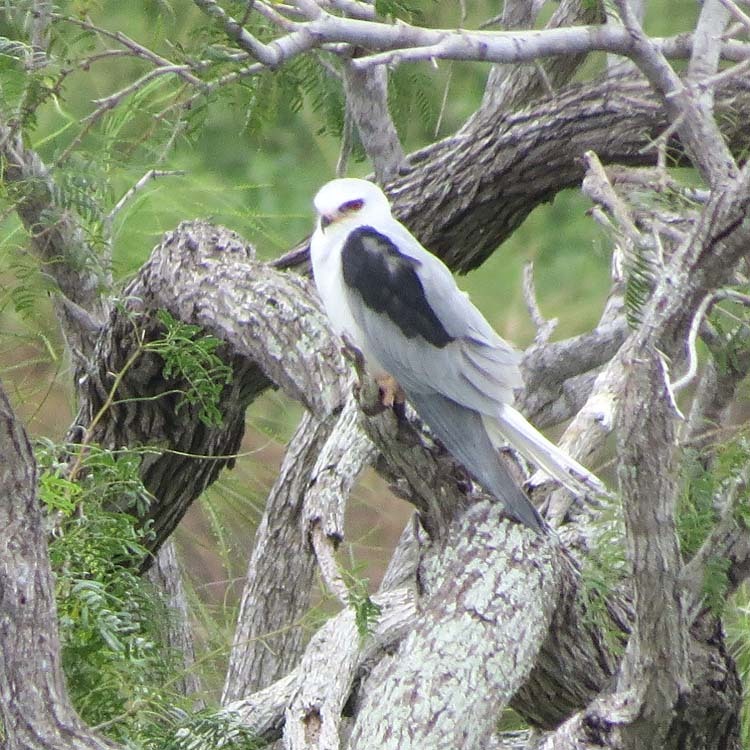 At the left of the ad is a photo I took of a White-tailed Kite that was perched a few feet from the Rio Grande on land that would be effectively chopped off from our country and made difficult to access for Americans if the wall were finished. That’s the original photo above. The ad is self-explanatory. It attacks the Republicans but was borne of frustration at the Democrats. I had listened to top-ranking Democrats like Steny Hoyer and Patrick Leahy discussing the wall. I could detect no outrage, no passion, and in my opinion, no sense that they were even confident of their own position that the wall was a bad idea. Hoyer ventured “…there are better solutions.” Well, of course he’s right in that: This is the era of Amazon defeating bricks and mortar, and there is no idea that more represents brick-and-mortar thinking than the wall. But saying there are better solutions fails to convey the fact that this would be national self-mutilation. My ad attacks the wall for being unpatriotic. That is the only point I made, and I made it because I feel the opposition is completely failing to make this point. The fact that the wall is a tax-and-spend classic example of government waste has been made by opponents, and the point of irony noted. I didn’t bring up any criticism that ripping children from the arms of their mothers is wrong or that double-crossing the DACA kids is wrong because, to a certain extent, those issues are out there and more or less understood and people have made up their minds and solidified their positions already. However the inability to see or understand that the wall is unpatriotic is an oddity based on the unfamiliarity most people have with this area. People on both sides are completely missing what the wall would mean. The best way to think about it is to imagine a wall built along but away from some other border, like a wall built along New Jersey’s eastern border with the Atlantic Ocean that had to be built back from the high water line. It would cut off the beaches and barrier islands along with the casinos of Atlantic City. People would immediately understand that it should not be built. This wall is no different. What follows is a gallery of shots I took in 2015 in what would become “No-mans-land” if the wall is finished. 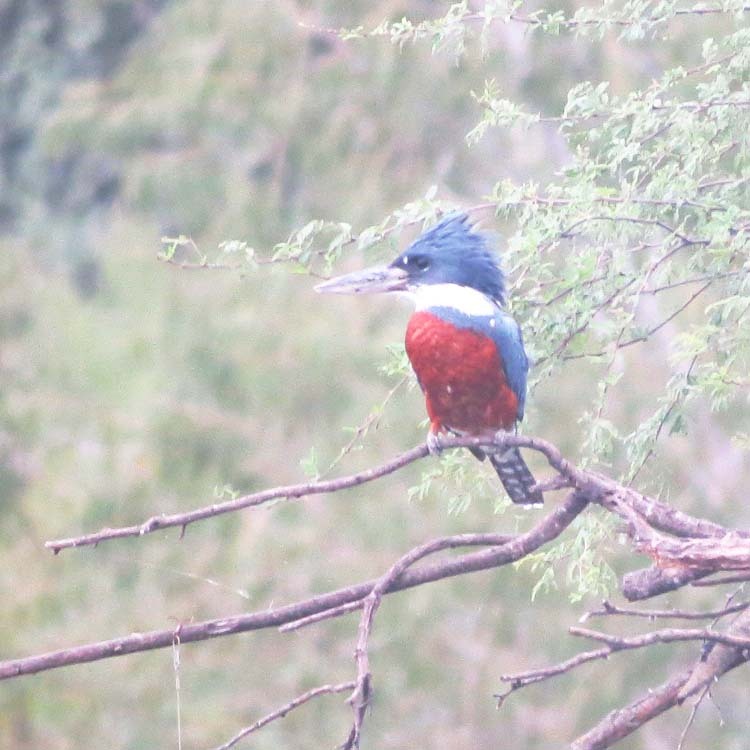 Ringed Kingfisher at Bentson State Park. Bentson was a US Senator who must be rolling in his grave as his family donated their ranch to be preserved for the future. 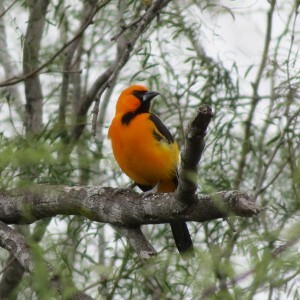 Altimira Oriole at Soleneno. (the second n should be an enya.) This is the largest Oriole in the United States, a species that is in trouble and doesn’t need a kick in the face when it’s down. 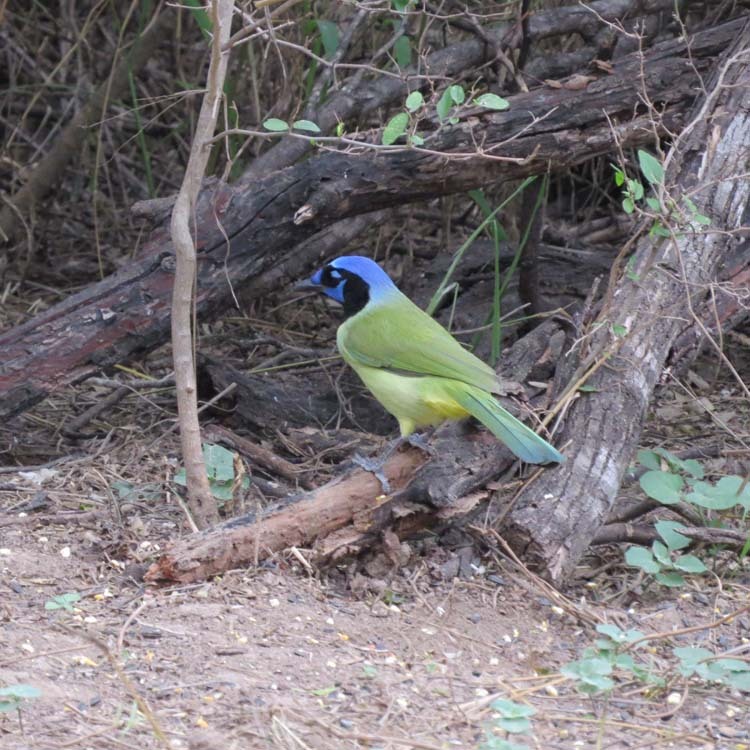 Green Jays are abundant in the Valley. This was at Soleneno. 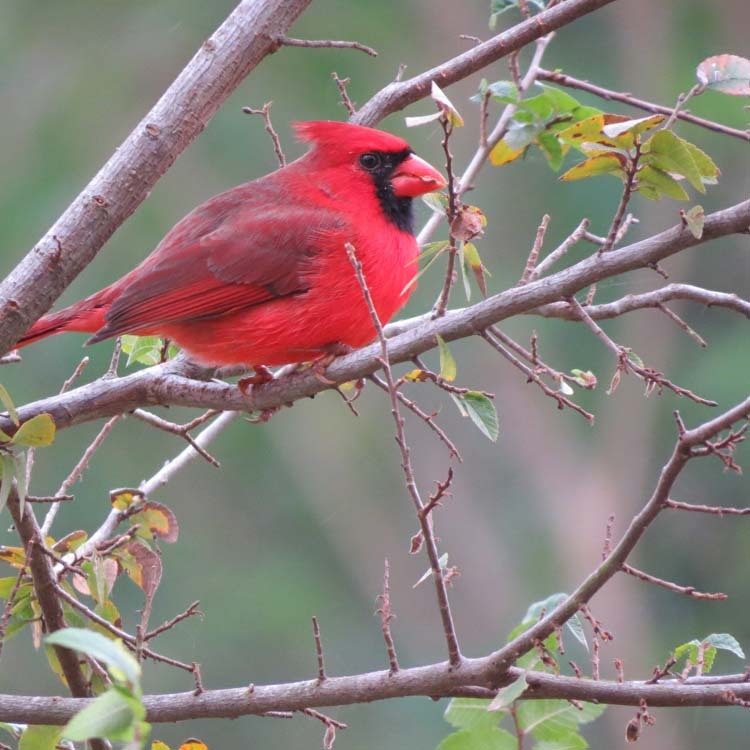 Nowhere are Northern Cardinals a brighter red than in the Valley. 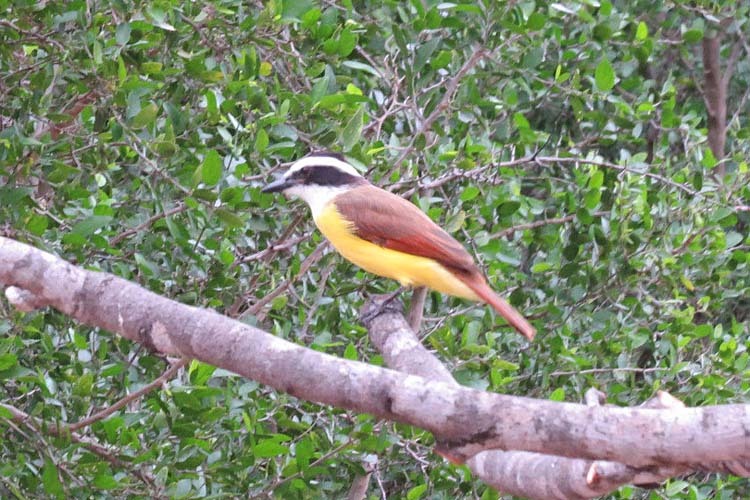 Here’s a Great Kiskadee at Estero llano. 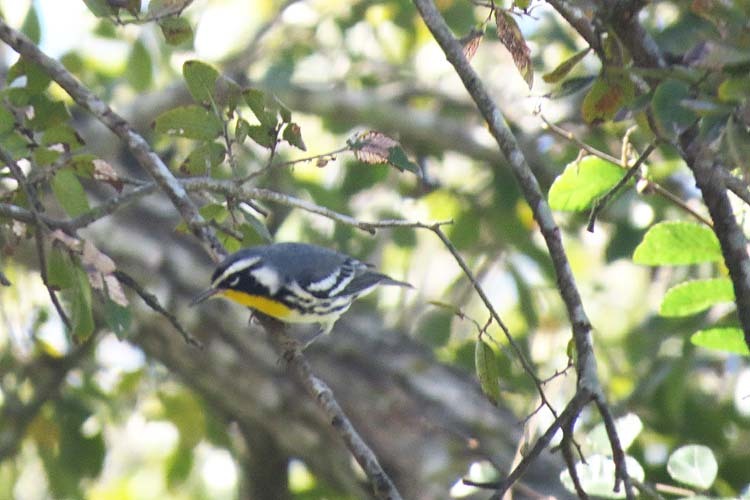 A Yellow-throated Warbler at Anzelduis Park. The observation tower at Santa Ana NWR. The forest at Santa Ana that I remembered from 1979 is gone completely, done in by the Falcon Dam which ended the seasonal flooding that brought moisture and fertility to the valley. What has survived is still, however, a superb example of Nature in its splendor. To bulldoze and destroy it is an assault on God and Country. 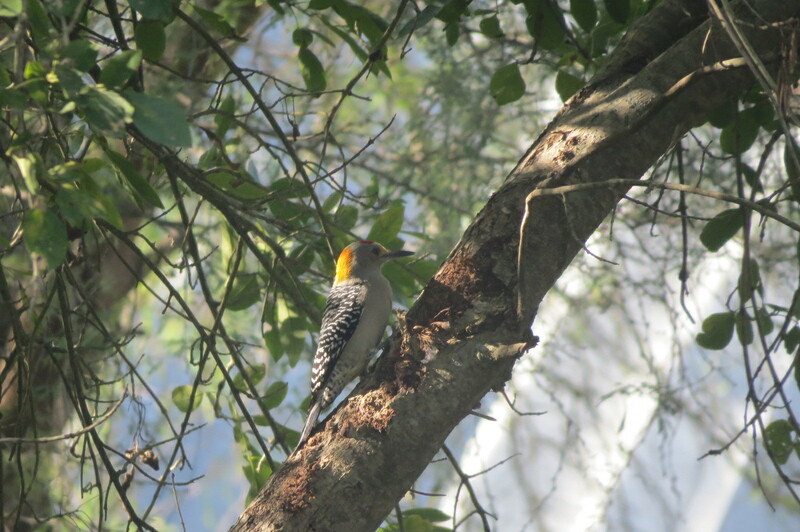 This is the main Woodpecker in the Valley, the Golden-fronted, and my shot doesn’t do it justice. 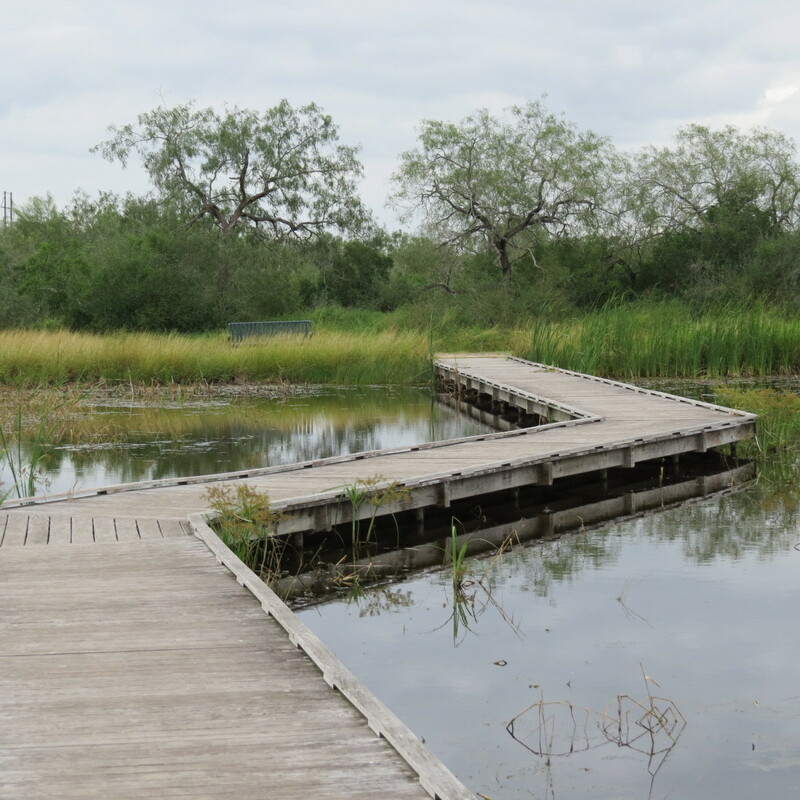 The Boardwalk at Estero llano. Hey Ed, this is Chris – just testing the comment form.